Given an undirected graph G = (V,E) and an integer ℓ ≥ 1, the NP-hard 2-Club problem asks for a vertex set S ⊆ V of size at least ℓ such that the subgraph induced by S has diameter at most two. 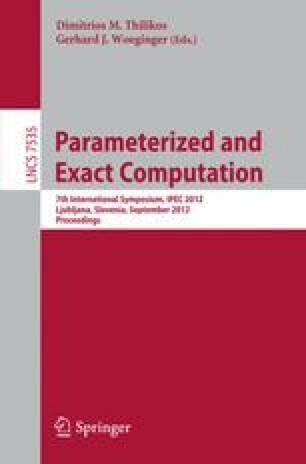 In this work, we extend previous parameterized complexity studies for 2-Club. On the positive side, we give polynomial kernels for the parameters “feedback edge set size of G” and “size of a cluster editing set of G” and present a direct combinatorial algorithm for the parameter “treewidth of G”. On the negative side, we first show that unless NP ⊆ coNP/poly, 2-Club does not admit a polynomial kernel with respect to the “size of a vertex cover of G”. Next, we show that, under the strong exponential time hypothesis, a previous O *(2|V| − ℓ) search tree algorithm [Schäfer et al., Optim. Lett. 2012] cannot be improved and that, unless NP ⊆ coNP/poly, there is no polynomial kernel for the dual parameter |V| − ℓ. Finally, we show that, in spite of this lower bound, the search tree algorithm for the dual parameter |V| − ℓ can be tuned into an efficient exact algorithm for 2-Club that substantially outperforms previous implementations.